Ian was born in London, but at an early age went to live in Santa Barbara, California USA with his parents until the age of seven. Ian's lifelong love of music began one evening in America whilst watching Frank Sinatra on T. V. with his father. After one of Sinatra's legendary TV. performances Ian, who was at the time only 6, turned to his father and said "that's what I am going to be! a singer". Ian has loved and emulated Mr Sinatra's music ever since. After returning to the UK he started taking singing lessons at the age of eleven with four different singing teachers. His big break came when his last singing teacher arranged for him to audition for the big band singer in the film 'Yanks' featuring Richard Gere. He was chosen for the part out of 400 others at the age of just 16! The movie was a huge success, taking 4 months to film and he sang with an 18-piece band, which he greatly enjoyed. Ian was very aware that his singing idol, Frank Sinatra had begun his musical career in almost exactly the same way, singing with a big band. During this period Ian learnt all the classic Sinatra arrangements. He then fronted his own jazz quartet, performing at club venues. At just 20 years of age he started cruising on the original Oriana, performing with a production company, in such starring roles as Tony in West Side Story. After returning home from his cruise, Ian finally managed to get a ticket to see his idol in person for the first time 'The Chairman of The Board'� was coming to The Royal Albert Hall. It was a magical evening that Ian would never forget and he would see his idol twice more in concert over the coming years. He still mentions these performances in his shows today. He then auditioned for Radio 2 and was picked as a session singer with the BBC's live orchestras. He went on to be a featured Male vocalist on BBC's Radio 2. Having a vocal range of nearly four octaves, he has been able to transform both contemporary and standard tunes into a style that makes him an individual performer constantly being in demand as an international artiste. Ian has performed at the famous London Palladium, The Talk of the Town, and The Savoy, to name but a few. He was the only male vocalist invited to perform to the British Troops during the First Gulf War. He has had the honour of going to Buckingham Palace to perform in a charity concert. Ian has always admired Frank Sinatra and this prompted him to begin a tribute show in the early 90's. The show has gained worldwide recognition indeed, whilst he was in America he received 18 standing ovations in only 9 shows. The Americans seemed to love this young English Sinatra. Ian took the brave decision to turn down the UK tour of the Rat Pack (Live from Las Vegas) and also the European tour in order to create Classic Sinatra. 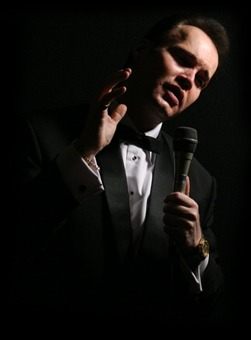 Ian's tribute has been so successful that it has been endorsed by the Sinatra Music Society. Ian was honoured to have appeared at The Federation of Small Business Awards this year, he was also chosen from many other Sinatra style singers to appear at a special dinner in the honour of the late Sir Bobby Robson who was himself a great Sinatra fan and remarked on Ian's performance. A special appearance this year in the presence of H.R.H. The Duchess of Gloucester was another of Ian's many achievements with future engagements booked. Call Now on 01268 412806 / 07768 872587 for an information pack.